We have everything that you need for a Detroit engine rebuild. We have everything stocked and ready to shipped, including our popular Detroit Diesel Series 60 rebuild kit. Overhaul your engine and give it new life with rebuild kits. Here you can read more about our overhaul kits, or look through all of our Detroit Diesel rebuild kits below. We started Diesel Pro with two simple missions: to provide high quality parts at better prices and to provide an easier way for people to get the parts they need. Our well-stocked inventory includes all of the parts that you need to keep your Detroit Diesel engine running, including Detroit Diesel engine overhaul kits designed to maximize your engine’s performance. We strive to provide you with the best customer service, and help for any part of the buying process. We have a friendly sales staff who are able to help you place an order, find a part, or help you with troubleshooting any engine issues you may have. So if you have a question not answered here, no problem! Just send us a quick message, or call 1-855-523-2127 and we will be happy to help. What is the difference between your cylinder kits and this kit (overhaul kit)? 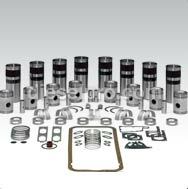 Our inframe/overhaul kits have more items, and are specifically made for each engine type, so you will get all of the cylinders, pistons, pistons rings, connecting rods, connecting rod bearings, crankshaft bearings, thrust washers for the ENTIRE engine. So, if you have an 8 cylinder engine, you will receive 8 cylinders with our inframe kit. Our cylinder kits are designed for work on a single cylinder at a time. For example, if you order the 8V71 Cylinder Kit, it would only come with one cylinder, whereas our 8V71 Inframe kit would come with eight cylinders. What are some advantages of using an inframe/overhaul kit? With an inframe kit, you can replace many key elements of the engine without having to disassemble the entire unit. It is a way to get an engine back up and running like it should, that requires fewer parts being taken off before doing so. I want to do a full overhaul of my engine. What else is needed? The inframe kit is a good start to get the engine back up and running. If you want to do a complete overhaul, it is a good idea to also buy new injectors, fuel pump, fresh water pump, blower repair kit and thermostat. With all of these items replaced, your engine will be as good as an engine with zero hours on it. It is also recommended that these items be kept in your shop, as spares, along with a raw water impeller and filters. What comes in your rebuild kits? Can you custom make one? Yes, we custom make each kit so you can get exactly the right kit for your project. The items that come in each kit varies, so please scroll down if you would like to see more information about a specific rebuild kit. The Detroit Diesel Series 60 rebuild kit, available either with piston or piston-less, is available for the 11.1 L, 12.7 L, and 14 L 60 series engine. Detroit Series 60 overhaul kit options vary slightly by part, but include a minimum of 6 cylinder kits, as well as crankshaft bearing set, connecting rod bearing sets, thrust washer, bushings, head bolds, camshaft bearings, and a gasket for the oil pan. To ensure that you purchase the correct rebuild kit for your Series 60 engine, you will need to know a few specifics about your engine measurements. This includes: the camshaft bearing size, connecting rod bearing size, liner size, and the type of rocket cover gasket. If you need any help identifying the correct overhaul kit for your needs, get in touch and we can help you out. Our 353 rebuild kit, comes with 3 cylinder kits, crankshaft and connecting rod bearings and four thrust washers. It also included the head and oil pan gaskets and the rocker cover gasket. In order to custom make a 353 rebuild kit, we need the size of the crankshaft bearings and the connecting rod bearings. We carry these for standard size along with 0.10, 0.20 and 0.30. Our 453 rebuild kit comes with four cylinder kits, connecting rod and crankshaft bearings, four thrust washers and all of the needed head gaskets. It also includes gaskets for the oil pan and rocker cover. Please note that we do not carry a complete overhaul kit for 453T (Turbocharged 453 Engines.) We do offer a cylinder kit, however. In order to do a complete overhaul, four would have to be purchased. The crankshaft and connecting rod come in four sizes, 0.10, 0.20, 0.30 and standard. Please contact us before ordering and we will make a kit that is custom made to your specifications. Our 6V53 Rebuild Kit includes six cylinder kits, bearing for the crankshaft and connecting rods, four thrust washers and gaskets for the head, oil pan and rocker cover. The 8V53 rebuilt kit comes with the same items, except it includes eight cylinder kits. The crankshaft bearings and connecting rod bearing come in standard size, 0.10, 0.20, 0.30 sizes. We also offer a cylinder hit for the 6V53T, turbo engine. Please call us with the size you need in order to get the right parts to you. Our 271 Rebuild Kit comes with two cylinder kits, bearings for the crankshaft and connecting rod and four thrust washers, as well as gaskets for the head, oil pan and rocker cover. The crankshaft and connecting rod bearings come in standard, 0.10, 0.20 and 0.30 sizes. The liner comes in the three standard sizes, as well as oversized 0.10, 0.20 and 0.30 pieces. For the two-valve 371, we offer the trunk type cylinder kit, or a kit for a one-piece piston. It also includes one cylinder liner (standard size), one piston assembly, ring set, piston pin, and two piston pin retainers. Please note, in order to do a complete overhaul, three would have to be purchased for the 371. For the four-valve 371 engines, we do not offer a full overhaul kit. However, we offer a cylinder kit that comes with a cylinder liner, one piston assembly, one ring set, one piston pin and two piston pin retainers. In order to do a complete overhaul, three would have to be purchased. We offer a cylinder kit for the 671 two-valve engine. This contains one cylinder line, one ring set, one piston assembly with a pin, and two piston pin retainers. This is for a one-piece piston type. For a complete 6 cylinder engine, six would have to be purchased. For the 671 four-valve and 671T (turbo) engine, both rebuild kits come with four thrust washers, six cylinder kits, bearings for the crankshaft and connecting rod. These kits also include head and oil pan gaskets, along with a rocker cover gasket. These are also for two-piece pistons. In order to have the right sized pieces included in your kit, the 671 four-valve and 671 turbo, we would need the measurements of the liner, crankshaft bearing, connecting rod bearing and the type of rocker cover gaskets. We carry standard sizes, and oversized 10, 20 and 30 sizes. The rebuild kit comes with six cylinder kits for the 6V71, eight cylinder for the 8V71, twelve for the 12V71 and sixteen for the 16V71 rebuild kits. They include a crankshaft and connecting rod bearings, four thrust washers, and all of the gaskets needed for the oil pan, head and rocker cover. We have one for two-piece pistons, and one for one-piece pistons. Our rebuild kits include six cylinder kits for the 6V92, eight cylinder kits for the 8V92, twelve for the 12V92 and sixteen for the 16V92. All of the kits also contain four thrust washers, gaskets for the heads, oil pan and rocker cover, as well as bearings for the crankshaft and connecting rods. In order to have the right, custom-made kit ready for you, we will need the crankshaft bearing size and the connecting rod bearing size. They are available in standard, 0.10, 0.20 and 0.30 oversized pieces. Call us today and we will custom make the rebuild kit with the correct sizes. For Turbo engines, we also offer both intercooled and aftercooled engines.